Some of the key companies operating in the global single-use bioprocessing sensors and probes market are Thermo Fisher Scientific Inc., Sartorius AG, Parket Hannifin Corporation, and Hamilton Company. A popular strategy employed by them to grow their shares in the market is widening the product base through carefully-considered alliances and acquisitions. Thermo Fisher, for example, acquired Finesse Solutions to foray into single use bioprocessing instruments and devices market. 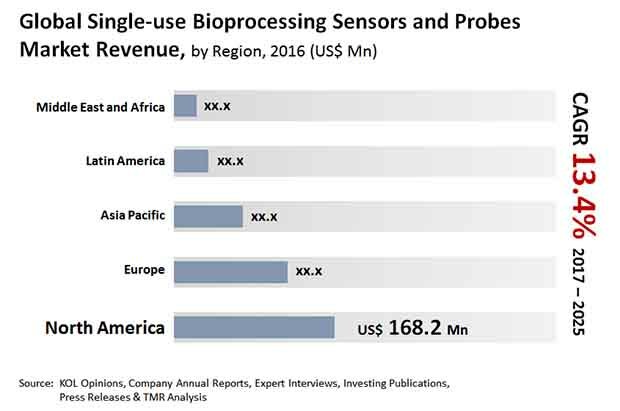 The global single-use bioprocessing sensors and probes market has regional companies and just a couple of global players. While this serves to up competition in the market, the different kinds of products offered by various companies lowers the degree of competition. As a result, competition in the global single-use bioprocessing sensors and probes market will remain moderate. As per a report by Transparency Market Research, the global single-use bioprocessing sensors and probes market will likely expand at a robust 13.4% CAGR between 2017 and 2025. Rising at this rate, the market which was worth US$418.3 mn in 2016, will grow to US$1281 mn by 2025. In terms of products, the global single-use bioprocessing sensors and probes market can be classified into pH sensor, valve, bench top control system, spectroscopy technology, optochemical DO (dissolved oxygen), temperature sensor, and pressure sensor. Of these, the bench top control system accounts for maximum share in the market in terms of revenue. In 2016, the bench top control system segment was valued at US$101.0 mn. Geographically, the global single-use bioprocessing sensors and probes market can be divided into North America, Latin America, Europe, Asia Pacific, and the Middle East and Africa. At present, North America is the dominant market and it held a 40.2% share in 2016. The market in the region is powered primarily by the U.S. which is a market leader in the region due to the developed research and development infrastructure and growing investment by the biotech and pharma industry. At the forefront of driving growth in the global single-use bioprocessing sensors market is the heightened thrust on improved, easier monitoring of bioprocess and the growing industrial demand for bioprocessing. “Globally, there is an increase in the growth of bioprocessing in the biotechnology and pharmaceutical sector. Global demand for biopharmaceuticals such as antibodies and vaccines to treat cancer, arthritis, and diabetes is increasing rapidly, driven by the increasing global aging population, rising obesity level, and the world wide effort to decrease the incidence of diseases preventable by vaccination. Hence, growth in industrial bioprocessing is anticipated to drive the single-use bioprocessing sensors and probes market in the next few years” explains the lead analyst of the TMR report. Serving to hinder the market, on the flipside, is the limitations and technical challenges in the use of single-use sensors. Environmental concerns over the use of disposables is also negatively impacting the market. This review is based on the findings of a TMR report, titled, “Single-use Bioprocessing Sensors and Probes Market (Products - pH Sensor (Electrochemical, Optical, and Solid- State), Valve (Pneumatic Pinch Valve and Electrically Actuated Pinch Valves), Bench Top Control System (Decentralized Control System and Programmable Logic Controllers), Spectroscopy (Raman Spectroscopy, NIR, and Scattering Spectroscopy), Optochemical DO, Temperature, and Pressure; Application - Biotechnology Industry, Pharmaceutical Industry, and Academic Research) Global Industry Analysis, Size, Share, Growth, Trend, and Forecast 2017 - 2025.